This five-book collection of the highly popular Living Lights Berenstain Bears stories provides children with an ideal gift they will enjoy for years to come. The biblical values, morals, and life lessons are invaluable for children throughout every stage of their lives. 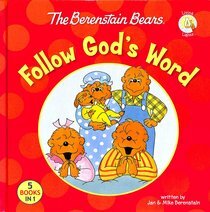 Includes 5 stories: The Berenstain Bears: Kindness Counts; The Berenstain Bears Go to Sunday School; The Berenstain Bears and the Golden Rule; The Berenstain Bears: God Loves You; and The Berenstain Bears Say Their Prayers. About "Follow God's Word (The Berenstain Bears Series)"
As the Bear cubs share their Easter candy, Papa shares the Easter Story (no animals in Papa's story).